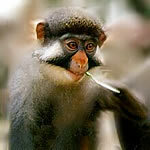 The red-eared nosed-spotted monkey is found on Bioko Island and between the Cross and Sanaga rivers. Although it is the most common monkey on the island of Bioko, it is still one of the rarest monkeys of Africa. Adults are gray in color with a brown back and shoulders. Their tails and ears are red, and their underparts are white. The face is purplish blue, with white cheek fur that stretches from the nose to both sides of the face. There are also black strips that appear above and below the cheeks. The habit requirements of this species is lowland and montane rainforest. Red-eared nose-spotted monkeys are very quiet in the forest, except when their soft trill-like contact call is heard. Little is known about their ecology and behavior. They are often found in groups of 4 to 35 consisting of females and their young and one male. Other species of guenon (such as the putty-nosed guenon) are often welcomed into the group for help with detecting potential danger. They are active only in the day and prefer to spend most of it in the trees. Diet consists of insects, shoots, leaves, and fruits, and while foraging, they are able to store food in pouches found in their cheeks. Females give birth to only one young. The population of this species has declined because of loss of habitat, hunting for its meat, and live capture for the pet trade. Although Nigerian law now prohibits hunting and trading, the practice still continues due to lack of infrastructure and awareness. Copyright Notice: This article is licensed under the GNU Free Documentation License. It uses material from the Wikipedia article "Red-eared guenon". Glenn, C. R. 2006. "Earth's Endangered Creatures - Red-eared Nose-spotted Monkey Facts" (Online). 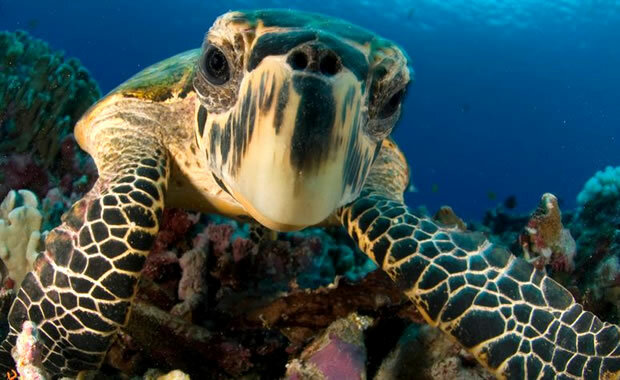 Accessed 4/23/2019 at http://earthsendangered.com/profile.asp?sp=281&ID=1. Need more Red-eared Nose-spotted Monkey facts?